Christopher Nolan’s Dark Knight trilogy (Batman Begins, The Dark Knight and The Dark Knight Rises) begins with the evocation of fear which becomes the motivational impulse for Bruce Wayne’s story. As a child he accidentally falls down a disused well, and, whilst he lies trapped and injured, he is terrified by a flock of bats that appear like a chthonic force of nature from the bowels of the earth. His father rescues him and tries to encourage a sense of self-overcoming: “Why do we fall? So we can learn to pick ourselves up.” The entire trajectory of the three films is set in motion with this brief motivational dictum. When the young Bruce attends a performance of the opera Mefistofele with his parents he experiences a panic attack brought on by some of the performers dressed as bats. Their appearance causes his primal fear to re-emerge. The family cut short the opera and leave, and this is why his parents end up being shot by a mugger in a street outside the theater. This is the crucial point in Bruce Wayne’s (and the film’s) development. Bruce has an opportunity to embrace an ethos that transcends, not only the self, but also the limitations of a late civilization. But such a prospect is intensely problematic for Bruce Wayne. As the head of Wayne Industries, he is not a typical inhabitant of Gotham; he is in some ways an aristocratic figure, almost a sort of medieval prince. This is partly suggested by the appearance of Wayne Manor which is meant to resemble an English stately home (and in fact, for both the original and the reconstructed Wayne Manors, English stately homes were used). And the point is further emphasized by casting the English actor Sir Michael Caine in the role of Alfred. Even more significantly, Bruce Wayne’s name is embedded in the architecture of Gotham. The central landmark of Gotham is Wayne Tower, and the transport network around the city is provided by Wayne Industries. The hub and spokes of the city are nominally identified with Wayne and he is born into a sense of noblesse oblige due to his father’s dual bequest of wealth and social responsibility. One of Bruce Wayne’s roles in this film is to return as the head of Wayne Industries and thus fulfill his inheritance and reclaim the name of the father. Thus, Bruce chooses to reject the meta-historical role offered to him by The League of Shadows and to instead focus on a very personal project of self-overcoming. He is offered Spengler but he accepts Jung. C. G. Jung’s concept of individuation is an important theme throughout the trilogy. It is first introduced by the rogue psychiatrist Dr. Jonathan Crane whose alter ego is Scarecrow. Whilst in the persona of Scarecrow, Crane drives Falcone to madness with his fear toxin, and Falcone is left babbling the single word, “scarecrow.” Crane explains that, “Patients suffering delusional episodes often focus their paranoia on an external tormentor, usually one conforming to Jungian archetypes . . . in this case a scarecrow.” It is significant that the film introduces this concept as a false explanation by a criminal psychiatrist. At the end of Batman Begins, Bruce has defeated Ra’s al Ghul, he has appropriated the symbol of the bat to represent the overcoming of his own fears, and he has forged an effective alliance with Jim Gordon of the Gotham police force. The crime syndicates have begun to be defeated and corruption has been tackled. But the appearance of the Joker’s calling card at the end of the film gives an intimation that all is not well. It also establishes that Bruce Wayne and Gordon are engaged in a process of endlessly deferring the collapse rather than preventing it, a tacit admission that The League of Shadows represents an inevitable process rather than a mortal adversary. When the Joker does appear in The Dark Knight he enables Bruce to confront the shadow side of his self. According to Jung, the shadow sometimes appears in the form of the trickster, a mythological motif that has both a collective, social function as well as an individual one. This makes sense because, as already mentioned, Bruce is nominally identified with the infrastructure of Gotham. The Joker represents the trickster in a number of ways. The trickster is the embodiment of the unconscious; he is not evil, it is just that his distance from any sense of rational order makes him do appalling things. Alfred recognizes this when he says that, “some men aren’t looking for anything logical, like money. They can’t be bought, bullied, reasoned, or negotiated with. Some men just want to watch the world burn.” The trickster can also appear as either male or female, just as the Joker does when he cross-dresses as a nurse. Even his observation that, “I’m a dog chasing cars. I wouldn’t know what to do with one if I caught it! You know, I just . . . do things,” hints at the theriomorphic form that the trickster will sometimes adopt. But most significant, and most sinister, is the Joker’s lack of a biography. When he is arrested the police are able to find no trace of him on their files, and they discover that his clothes are all hand made. He is disturbing because he appears to have no relational ties with society. He even seems to have no name. The subtextual implication here is that identity cannot exist without some form of societal context. The Joker emerges ex nihilo and has no connection to anything. Consequently, his motivations, as such, can never be comprehended because they can never be located in a particular context. He is a shade who is not afraid of death because, effectively having no identity, he is already dead. He also makes up stories about his past, giving contradictory accounts of how he got his facial scars. This lack of a biography lends an ethereal chill to the characterization. In contrast to a book such as The Killing Joke, which explores the family background and origin story of the Joker, The Dark Knight turns him into someone who seems to have never existed in society at all. We simply can’t get a grip on him because he doesn’t exist as a social agent. Whereas Bruce Wayne is unusual in the extent to which his own interests are embodied in the infrastructure of society, the Joker is unique because he has absolutely no interface with society at all. No family, no branded clothing, no police record; nothing. This makes him a particularly powerful iteration of the Joker because more mythic qualities are allowed to speak through him. Harvey Dent: When their enemies were at the gates, the Romans would suspend democracy and appoint one man to protect the city. It wasn’t considered an honor, it was considered a public service. Rachel Dawes: Harvey, the last man who they appointed to protect the Republic was named Caesar, and he never gave up his power. This identification of Batman with Caesar is only an intensification of the already existing identification of Bruce with Gotham. Just as Bruce seems to embody the interests of Gotham due to his investment in its infrastructure, the Dark Knight emerges as the Caesar figure who embodies the state in his own person. And this makes explicit the notion that the late phase of a civilization is the propitious moment for a Caesar figure to appear. There is thus a progression from Bruce Wayne in his role as technocrat ruler of the city state, the de facto Prince of Gotham, to the Dark Knight who becomes Caesar as a desperate response to the declining power of the state. Something worth noting is that although the trilogy is filled with gestures towards religious notions, there really are no religion and no gods anywhere to be found in Gotham. In Spengler’s terms, this accords with the formlessness of the age of Caesarism. The prior animating spirit has now disappeared from the civilization, the age of money has coarsened and promoted cynicism to such an extent that the very possibility of a religious awakening seems risible. But one real joy of Nolan’s trilogy is the way in which he continually allows the form of prior religious functions to intrude into the secular world of Gotham. 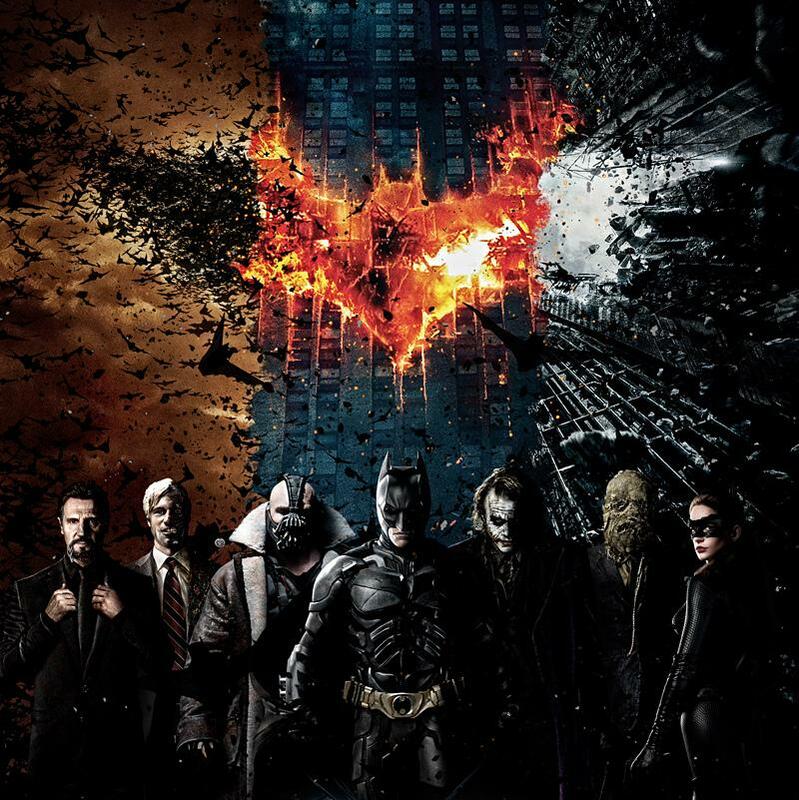 Whether this is in the form of the Dark Knight as a Messiah figure, or the apparent immortality of Ra’s al Ghul when he reappears in The Dark Knight Rises as an actual wraith, there is an implicit acknowledgement that the forms of religious observance are ineradicable, even if the gods themselves are not. In The Dark Knight Rises, The League of Shadows reappears in the guise of Bane. There is little to be said here about the course of this film other than to note that the League’s reappearance serves to underscore the inevitability of the form of historical unfolding that they describe. 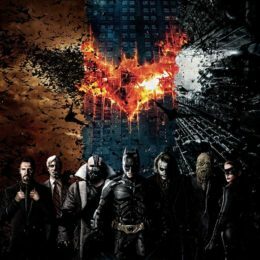 The Dark Knight has committed himself to preventing their victory, but the trilogy seems resigned to its inevitability. This is what gives a real feeling of tragedy to the films. The ending of The Dark Knight Rises seems problematic. After recovering the nuclear bomb from Ra’s al Ghul’s daughter, Batman flies off out to sea where the bomb detonates. It would appear that, having once more deferred the process of civilizational decline, the Dark Knight has now completed his mission of personal transformation in an act of supreme self-sacrifice, laying down his life to save his people. His realization of Messiah status is complete; perhaps there will also be a cult that will develop around him allowing the citizens of Gotham to rediscover the sense of the numinous that has now become so obscure to them. But we quickly learn that the Dark Knight’s sacrifice is actually no such thing. At the end of the film, Alfred sees Bruce and Selina Kyle seated at a nearby table whilst on holiday in Florence. Apparently, Batman did not die in the explosion after all. John Blake, the police officer who earlier confronted Bruce about his social responsibilities, then discovers the Batcave and we are led to believe that he will adopt the persona of Robin and continue the fight against corruption in Gotham. There is a school of thought that interprets Alfred’s discovery of Bruce and Selina as a dream, or fantasy, although the film itself makes it pretty clear that Bruce had set up his faked death in advance. Still, the happy ending does seem out of keeping with the darkness that had preceded it. There is something unsatisfying in learning that Bruce has emigrated to a life of domestic happiness, leaving the fight to save Gotham up to someone else. Thinking about the ending along these lines reveals that, in fact, the “happy” ending merely masks a very deep pessimism. The decline of Gotham will continue with increasingly ineffective interventions from the forces of law and order. Bruce’s personal transformation, which might have achieved its apotheosis in a moment of true self-sacrifice, has been put aside for the purpose of domestic tranquility. And the possibility of Gotham’s renewal through an act of numinous immolation is shown to be predicated on a lie. By the term “Caesarism” I mean that kind of government which, irrespective of any constitutional formulation that it may have, is in its inward self a return to thorough formlessness. It does not matter that Augustus in Rome, and Huang Ti in China, Amasis in Egypt and Alp Arslan in Baghdad disguised their position under antique forms. The spirit of these forms was dead, and so all institutions, however carefully maintained, were thenceforth destitute of all meaning and weight. Real importance centered in the wholly personal power exercised by the Caesar, or by anybody else capable of exercising it in his place. Hence the inevitability of Bruce’s very personal quest and the impossibility of his grasping the truths uttered by Ra’s al Ghul, truths which are literally above time. Bruce is living at the wrong point in history to be able to engage in a mission that might enable a transcendence of the self and the realization of a truly aeonic role, so he must confront his own inner demons and meanwhile do what he can for Gotham. True history cannot take place here. With the formed state having finished its course, high history also lays itself down weary to sleep. Man becomes a plant again, adhering to the soil, dumb and enduring. The timeless village and the “eternal” peasant reappear, begetting children and burying seed in Mother Earth — a busy, easily contented swarm, over which the tempest of soldier-emperors passingly blows. With his retirement from Gotham and his new life of family and contentment, Bruce reveals the full force of the trilogy’s pessimistic view of history. Gotham continues to fall, hope is built on a falsehood and each victory over the forces of chaos is brief. In Bruce Wayne Gotham really does get the hero it deserves. 1. C. G. Jung, Four Archetypes: (From Vol. 9, Part 1 of the Collected Works of C. G. Jung) (Princeton: Princeton University Press, 1970), 151. 2. Oswald Spengler, The Decline of the West (New York: The Modern Library, 1962), 378.